Sometimes when her momma gets the camera out, Thimble likes to pretend to be shy. This momma knows better, though, and always asks Thimble to please say, "Cheese!" But if a girl doesn't want to, she's not going to. Well, Thimble, at least your chin is pretty darn cute. Did you know that cats can get acne? It typically first manifests as dark spots, or blackheads, on the cat's chin, so be sure to do regular checks of that area on your kitty. Feline acne could potentially be caused by any number of things, including stress, poor grooming habits, low immune response, sensitivity or allergies to foods or other environmental conditions, and even ringworm or other underlying dermatological conditions. In some cases, acne can lead to swelling, and it can become itchy and lead the affected kitty to scratch at it, causing further trauma to the chin and surrounding areas. If you see acne on your kitty, therefore, do consider consulting your veterinarian and having it checked out. Your vet can rule out any underlying issues, and can prescribe any necessary treatments, depending on the cause and severity of the acne. Sometimes all it takes is a little cleaning or a simple topical treatment. Even kitties can't escape acne sometimes, so be sure to be on the lookout. Be cognizant and careful of the fact that many of today's manufactured products, such as pet toys and treats, contain parts and pieces and ingredients that are not all that natural or organic. Some such manufactured products could potentially lead to reactions in some dogs and cats, such as dermatological or other allergic reactions if an animal is sensitive to any particular component of a product. For example, some toys may contain plastics to which some animals can be sensitive. Also keep in mind that some products contain certain additives, such as artificial flavors and dyes, that could potentially cause reactions in sensitive dogs or cats. (My firsthand experience: I once had the nerve to buy Astrid a chew bone that was bacon flavored and unnaturally orange in color. Within a day, her lips had started to form swellings and sores that obviously itched, and her vet had to prescribe a medicated ointment to clear up the reaction.) Be aware of what all unnatural components might make up a particular toy or treat. Try to always look at the labels on the products you buy for your furbabies, and consider investigating whether certain items are natural or organic. No matter what type of product it is, though, it's always wise to keep an eye on your furbaby after he or she tries out something new. After all, better safe than sorry! I'll preface this review by saying that my feline furbabies can be, to put it simply, food snobs. When it comes to yummy, stinky, should-be-delicious moist foods, they'll often turn their noses up and walk away. Whereas some brands and flavors are gobbled up, others are barely nibbled at, if even at all. My girl Thimble loves the concept of moist food, and she is the only kitty in the house who will wake me up in the wee hours of the morning to lead me to the empty moist food dishes. She often follows up this ritual, though, by simply sniffing the food I offer and sauntering off as if she has far better things to do, like talk to the closet door. Then there's Evan, who will sometimes show absolutely no interest in moist food at all, while at other times gobbling up an entire bowl of it and then moving on to the next bowl as if it might be his last meal. And Eddy, well, Eddy acts like moist food doesn't even exist. Honestly, the girl is infatuated with dry food, and that's it. Well, she'll eat bugs, too, but I guess that doesn't count. And housemate Toby's reaction to moist food is all over the board. He ignores it, he begs for it, he loves it, he hates. The boy doesn't know what he wants. Despite all of that, I put out moist food every day. I used to work at a cat clinic where I'd see so many cats come in with everything from UTIs to urinary tract blockages, often in large part because the kitty simply wasn't taking in enough moisture. And so, even if only to make myself feel better, my kitties are offered moist food every single day. That's why, when I got the list of goodies for this month's Chewy.com Blogger Outreach Program, I perused it in search of what I thought might be the most deliciously moist and enticing yet also natural and healthy food to hopefully attract my furbabies' attention. In the end, I chose Nature's Variety® Instinct® chicken formula. Nature's Variety® Instinct® chicken formula moist food is labeled as 95% chicken, turkey, and liver. The other 5% is vegetables, fruits, and other wholesome ingredients. Food like this always makes this momma happy, since the first ingredients listed are, indeed, real meat. This food is also grain-free and gluten-free. I also liked seeing that it was made in our very own USA. So, this momma was very happy with this food's first impression. But, what about the furbabies? Well, my little felines certainly seemed interested in it from the get-go. I couldn't even get a can of it opened before they were hovering over me like vultures. I hoped that was a good sign. I wouldn't know until I offered them some, though, and so I opened up a can and started divvying it out into their bowls. The first thing I noticed was that this is a very juicy sort of food, as it was sitting in a plethora of gravy. For me and my furbabies, this is always good news! If a moist food isn't, well, moist enough, my little felines won't even give it the time of day unless I add water to it. For this food, I didn't even have to consider adding water, because the gravy at the bottom of the can was more than enough to make the food perfectly moist and mushy and pungent. So, there was another plus. But, I still needed to see if my furbabies would eat it. My biggest food beggar is Thimble. This can be a bit ironic, though, because she's also the most likely to, as I said earlier, simply sniff the goods and walk away. Naturally, she was at my feet the entire time I prepared the food, and so I let her try it first. After a couple more licks and some additional lip-smacking, Thimble called it quits and walked away. Don't let that fool you, though, because that is completely normal for her. Although she is a beggar, she is far from a gorger. The fact that she took even one lick, let alone a couple more, is a sign that she actually liked the food. It usually means that she'll come back to her bowl later and have some more, which she did (after I put my camera away, of course). What about the other kitties? Well, we've already established that Eddy isn't a valid option in food reviews. If it's not her favorite dry food, or a bug, it's not even on her radar. And as for Evan and housemate Toby, well, at the time I first offered the Nature's Variety® Instinct® food and had my camera out, they were too busy chasing each other up and down the hallway to listen to my food calls. However, as I've become accustomed to doing with my furry food snobs, I left the bowls on the floor for a while to see if anymore kitties would pass by and notice. And they did. Evan rolled through not long after and had himself a taste of it, and then some more tastes. Housemate Toby tried it out as well, and had himself a nice little snack of it. What's more, I've given them a couple more cans of it since then, and each time they keep eating it! And so, it would seem that my furry little food snobs give Nature's Variety® Instinct® chicken formula moist food four paws up. And that makes this momma very happy. For the record, the stray cat (potentially feral cat, as he seems to have no interest in being touched by a human) that likes to hang out on my back patio also likes the Nature's Variety® Instinct® chicken formula moist food. In fact, he loves it and can scarf down a bowl of it in the blink of an eye. Disclaimer: As members of the Chewy.com Blogger Outreach Program, we received Nature's Variety® Instinct® chicken formula moist food as compensation in exchange for an honest review. All opinions are our own. We only review products that we believe will be of interest to our readers, and we never recommend a product that we do not believe in. This seems like a good post to revisit a previous tip regarding water intake in cats...Always keep in mind that cats are, by nature, strict carnivores. Since animal meat consists heavily of water, yet our domesticated kitties aren't necessarily going out to catch their meals, it is often up to us humans to make sure that our felines have access to and are consuming sufficient water. Having plenty of fresh water available as well as feeding moist food are two primary ways to help ensure that your kitty is taking in enough water. With a diet low in moisture content, a cat can be at heightened risk for any number of urinary tract disorders, among other potential health concerns. So, always put out plenty of fresh water for your kitty, consider feeding moist food if you are not already doing so, and of course consult your veterinarian with any concerns. Today Evan is here to show off, well, our front door. Evan loves the front door. He loves sleeping on the welcome mat at the front door, he loves looking out the front door, and he loves greeting his mom at the front door when she comes home from work (for the record, this momma loves this part of the day just as much as Evan does!). Obviously, Evan is our resident doorman. And, he takes his job very seriously. Sometimes, though, being doorman can be quite tiring. Sleeping on the job, Evan? Wishing all of our furiends a happy Monday! We hope this week treats everybuddy well! Our tip from yesterday mentioned putting your kitty's food up on an elevated surface (such as a counter or table) to protect it from any resident dogs, toddlers, or other cat food thieves. Today, we'll touch upon the opposite option. As mentioned yesterday, there are some kitties, such as those who are old and/or arthritic, who may not be able to reach an elevated food bowl. If your kitty falls under such a category, or if you simply don't wish to put the food bowl on an elevated surface, you can try keeping it out of reach of any dogs or toddlers by placing it in some sort of cubby where only your kitty can fit. This could even be a makeshift eating cubby, such as one made from an upside down cardboard box or Rubbermaid container with a little kitty-sized door cut out. There are also certain pieces of furniture on the market with cubbies such as this already built in. Using such a feeding station can also come in handy if trying to help an overweight kitty lose weight in a multicat home - so that your other kitty or kitties don't have to go on a diet, you can place their food in an eating cubby with a door through which an overweight kitty cannot fit. Of course, in the end, only use an eating cubby if your kitty is willing to eat in an enclosed space. It's time for the Sunday Selfies blog hop, hosted by the fabulous Kitties Blue over at The Cat on My Head! Our first selfie of the day is a special one, and it's brought to you by the ever active Eddy. It's special not only because it was taken in one of Eddy's rare moments of relaxation, but because it was taken while she helped me complete the wedding art for none other than the Kitties Blue ladycat Astrid and her now hubbycat Sampson (of Kitty Kat Chronicles). Eddy waited weeks to share this selfie until today, because she wanted to use it to congratulate Astrid and Sampy, who just tied the knot this weekend during the BlogPaws Conference. So, congratulations to Astrid and Sampy, from Eddy and all of us! Although they didn't snap any shots of them helping me create Astrid and Sampy's wedding art, my other furbabies have some selfies to share nonetheless. Happy Sunday to all of our furiends! Especially if you have a cat food loving dog, a toddler, or any other form of potential cat food thief, perhaps consider elevating your cat's food dish to a level unreachable by such thieves. Cats can jump as much as seven times their own height. That makes it easy to designate a particular shelf, counter, table, or any other elevated surface as your cat's feeding station, should the need arise. Of course, keep in mind any special conditions your kitty might have when selecting a location for their food bowl. If your kitty is overweight, older, has arthritis, or has any condition that makes jumping difficult, consider this before elevating his or her food bowl very high, if even elevating it at all. Even for a young and fit kitty, though, you can always make it easier on them by placing the food dish somewhere elevated but also somewhere that has some form of pathway or makeshift stair steps (such as other pieces of furniture) leading up to it. We've made it to the weekend, everybuddy! 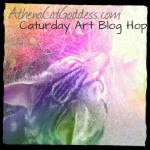 As always, first up for the weekend is the Caturday Art blog hop, hosted by the lovely Athena. For our Caturday Art contribution, we're sharing the image that we will be using as our summer header starting tomorrow. 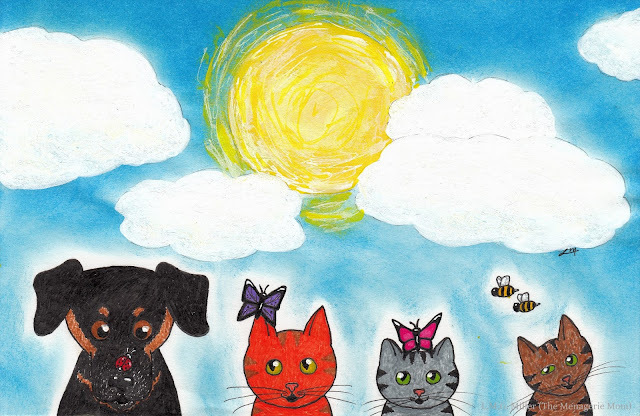 This piece of course stars my furbabies, as well as some little summertime friends they found. How about all of our furiends out there? What do you think of those little fluttery and creepy-crawly critters out and about this time of year? Do you make friends with them? Do you like to chase them? In some past tips I've talked about summer care for pets, and in other tips I've mentioned having emergency and disaster plans that include your furbabies. Today, let's combine the two. Sometimes summer brings with it heat advisories, sometimes even excessive and potentially dangerous heat advisories. In cases such as these, whether you simply don't have an air conditioning unit or whether you have an air conditioner but it fails or the power goes out, be very cognizant and cautious of the temperature inside your house. Most importantly, have plans in store for keeping your furbabies cool in the case of summertime emergencies. Do you have a plan that will keep your furbaby safe from heat exposure or heat stroke? Some plans can include simple solutions, such as using plenty of fans, opening windows, spending time outdoors in the breeze during the coolest parts of the day, and placing extra or iced water out for your furbaby. However, some of these solutions only work so well and only for so long. In cases when sufficient cooling is not available at your house, it never hurts to have a temporary relocation plan in place. Is there a friend or family member who could take in your furbaby should cooling measures at your house become insufficient? Is your furbaby established at an air conditioned boarding facility? Summer sure can be a time for fun, but it also has its potential dangers, and it never hurts to think ahead! Happy Friday, everybuddy! 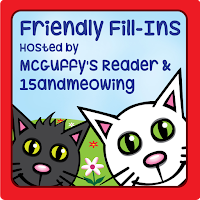 As usual, we'll start this Friday off with the Friendly Fill-Ins challenge, hosted by our furiends over at 15andmeowing and McGuffy's Reader. My feelings get hurt when _________. I am excited about _________. One time, I _________, that's why _________. We had some rain (and I mean Noah's Ark kind of rain) this week. But, it's sunny now! We hope all of our furiends are enjoying some sunshine as well! Concatulations to The Island Cats! Sorry, kitties, but no more litter art on the floor for you! For those who didn't win the giveaway but who are still interested in acquiring one of these great litter mats, Smiling Paws Pets has so kindly granted my readers a 20% off discount voucher! The discount code is furballs20, and can be redeemed on their website. If you have to leave your furbaby home alone, whether it be for work or simply for a day or night out, there are plenty of things you can do to try and help your furbaby pass the alone time without getting bored or anxious. Be sure, for example, to leave your furbaby plenty of safe toys to keep them busy, as well as full bowls of food and fresh water. This way, your furbaby won't feel the need to fret about the availability of their basic necessities. And, of course, don't forget to leave them plenty of cozy places to snooze, which could include using your own clothing as a furbaby bed. And don't forget to leave them window views, because when all else fails, Squirrel TV is just about the best thing around! What's more, to help your furbaby feel at home even while you're away, leave a light on for them, especially if it will be growing dark before you return home. You can also leave a radio and/or television.on a low volume for a bit of comforting background noise for your furbaby to hear. I'm sure being ridiculously cute must be hard work. My girl Thimble certainly knows all about that (if I do say so myself). Sometimes, she's so cute it wears her out. But, it's nothing a little shuteye won't fix! Happy Thursday, everybuddy! 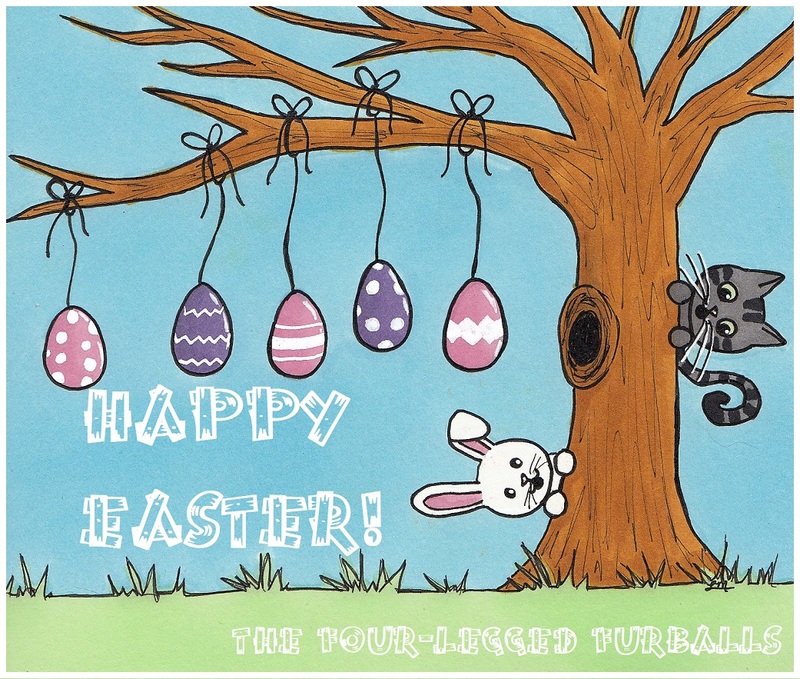 We hope all of our furiends attending the BlogPaws Conference have a grand time! Did you know that cats can't move their lower jaw from side to side? Cats utilize up and down chewing motions rather than side to side. This is why you don't see cats gobbling up big pieces of food like dogs or even humans, and why you see cats tilting their heads while chewing their food. So, when choosing or giving your kitty food or treats, to help him or her enjoy it more readily, try to make sure it's in small pieces. That way, they won't have to work extra hard to eat their goodies. Sunny summer days are here! Always be aware and cognizant of potential summertime dangers for your furbabies, though, as some of the things that come along with summer can be hazardous to dogs and cats. For example, sunscreen and bug sprays contain chemicals that could potentially harm your dog or cat, especially if ingested in large quantities. Pool chemicals, such as those containing chlorine, can be corrosive and otherwise dangerous for your furbabies as well. Also be cautious if visiting a beach with your dog, since although they don't realize it, excessive salt water intake can be dangerous for dogs just as it can be for us. And of course also be aware of the potential dangers of even the most basic, simple attributes of summer, such as the sun and insects. It's certainly okay to have fun, as long as you're careful as well! Astrid is here today to give our very first ever review as part of the Chewy.com Blogger Outreach Program! When we got our first list of products from Chewy, I was so glad to see Purina® Pro Plan® Veterinary Diets FortiFlora on it. This probiotic supplement powder comes in both canine and feline versions. I requested the canine version, as Astrid is my only furbaby who has a history of a sensitive stomach and the occasional disgruntled intestines. May even increase a pet's desire to eat! Now, before I move on to Astrid's testing of this product, I want to note that, although obtainable without a prescription, Purina® Pro Plan® FortiFlora probiotics are indicated as a "veterinary diet" supplement. The label indicates that these should be given "under the supervision or direction of a veterinarian". Astrid has a history of occasional intestinal issues, for which her veterinarian has examined her and approved the use of probiotics. Therefore, as recommended on the label of the Purina® Pro Plan® FortiFlora, should you have any concerns regarding your dog or cat's intestinal health or wish to use probiotics, consult your veterinarian if you have not already done so. That all being said, the arrival of that wondrous Chewy box happened to coincide with one of Astrid's intestinal flare-ups. It was the perfect time for us to give the Purina® Pro Plan® FortiFlora a try. These probiotics come in a box of 30 packets, and the instructions advise that one packet be given daily. Again, consult your veterinarian regarding probiotics if you have not already done so. In line with previous veterinary consultation, Astrid only receives probiotics when and as needed. Since she was indeed showing signs of intestinal distress, we poured the recommended one packet into some of her moist food. I have before administered this sort of powdered supplement on dry food as well, so moist food is not a must. But, I have found it far easier to stir this sort of supplement into moist food. Although she has received her fair share of probiotics, I had never before used Purina® Pro Plan® FortiFlora for Astrid. So, the next step was the taste test. I wasn't sure whether she'd notice or care about the addition of the probiotics to her food. So, what did Astrid think? She gobbled the probiotic-endowed food right up! What's more, whether we can wholly thank the packet of probiotics or not, by the next day Astrid's intestines seemed happy as could be and all was normal again. Therefore, we did not administer anymore of the Purina® Pro Plan® FortiFlora to her. But, we know we'll surely need it again in the future and are glad to have it on hand. Wishing all of our furiends a wonderful Tuesday! Disclaimer: As members of the Chewy.com Blogger Outreach Program, we received Purina® Pro Plan® Veterinary Diets FortiFlora as compensation in exchange for an honest review. All opinions are our own. We only review products that we believe will be of interest to our readers, and we never recommend a product that we do not believe in. A dog or cat can manifest diarrhea for any number of reasons. For example, intestinal parasites, such as hookworms, could lead to diarrhea. Certain viruses, such as distemper or parvovirus in dogs, can also cause this symptom. Changes in diet, unhealthy table scraps, and ingestion of a toxin or foreign object are other potential causes. And, of courses, diseases such as pancreatitis and cancer can also result in diarrhea. If your furbaby develops diarrhea, especially if it persists, please consult your veterinarian. Diarrhea can potentially lead to dehydration and other complications if not treated properly, and complications can especially be of concern in very young or geriatric animals, or any animals compromised by existing conditions. Therefore, if your dog or cat has diarrhea, please consult your veterinarian. If an appointment is scheduled, be sure to take a fresh stool sample with you, so that the veterinarian can begin proper testing as soon as possible. My mancat Evan loves to watch out the front door. He's my little sentry kitty, making sure the neighbors and squirrels and bugs all stay in their rightful places outside. This, however, can be very tiring work. Don't worry, though, because the door also serves as a purrfect pillow. Oh, I'm sorry, Evan. Am I disrupting your beauty rest? We hope all of our furiends had a lovely weekend and a wonderful Father's Day! Happy Monday! Even our furbabies come with paperwork, and it's important that we keep this paperwork all together and organized. It never hurts to have vet bills and medical history, rabies vaccination certificates, microchip information, and all other paperwork for your furbabies at the ready in case anything should happen. For example, if your furbaby were to require an emergency vet visit after hours or on a weekend, when your regular is not able to send over medical records, it can be of great benefit to the emergency vet if you are able to provide your pet's history. Having your furbabies' paperwork could also be of benefit if you were to travel with your furbaby, if you were to relocate or change vets, and even if your furbaby were to become lost. So, although paperwork may not be fun to sort through and store, please be sure to keep your furbaby's records organized and on hand. 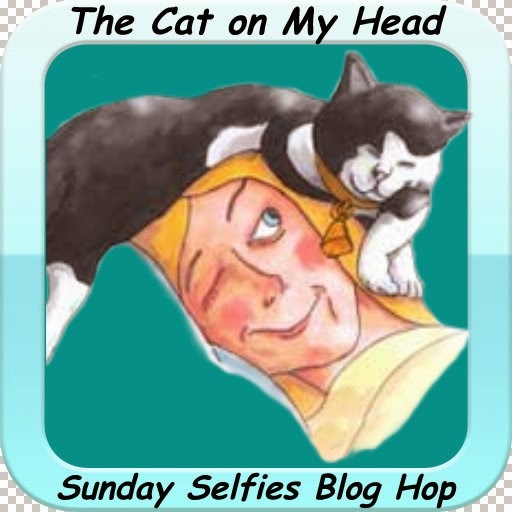 My girl Thimble asked to be the star of our post for today's Sunday Selfie blog hop, hosted by the funtastic Kitties Blue over at The Cat on My Head. After all, her post on Thursday was full of her best grumpy shots, and now she wants to show off that she indeed still has a ridiculously cute face. There you have it. Thimble is grumpy no more. Happy Sunday to all of our furiends, and a Happy Father's Day to all the dads out there! Despite popular belief, cats cannot see in total darkness. They can see far better than humans in dim lighting or near darkness, but cats do not have night vision in the sense that they can see in pitch black settings. That being said, it never hurts to leave a light on for your kitty at night, as they can indeed benefit from the lighted assistance. My furbabies and I are loving how this weekend is kicking off. For one, it's Caturday, which means the Caturday Art blog hop we enjoy so much, hosted by our furiend Athena. That's not all, though, because today is also International Box Day! And it sure seems like that's pretty much every kitty's (and I'm sure plenty of pups') dream come true. While all of my feline furbabies enjoy a good ol' box, there's one who goes especially bonkers for those cardboard paradises. Which furbaby is that, you ask? Evan! 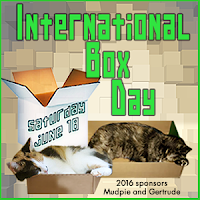 As you can see, we've rolled our Caturday Art and International Box Day celebration into one. It seemed like the thing to do (especially since pouring through hundreds of photos somehow still left me devoid of any kitty-in-box pictures - how is that even possible?!?). Evan wants to know, what are your favorite box games to play? He likes to use his boxes to play hideaway and ambush. How about you? Today seems like the perfect day to revisit a previous tip we gave a while back...If you find yourself with a decently sized cardboard box, don't toss it out right away. Let your kitty have some play time in it. You can toss it on the floor as is, or you can turn it into a cardboard kitty cottage by cutting a door and some windows into it. You can take it a step further by saving up a few boxes and using them to create a whole cardboard kitty castle. 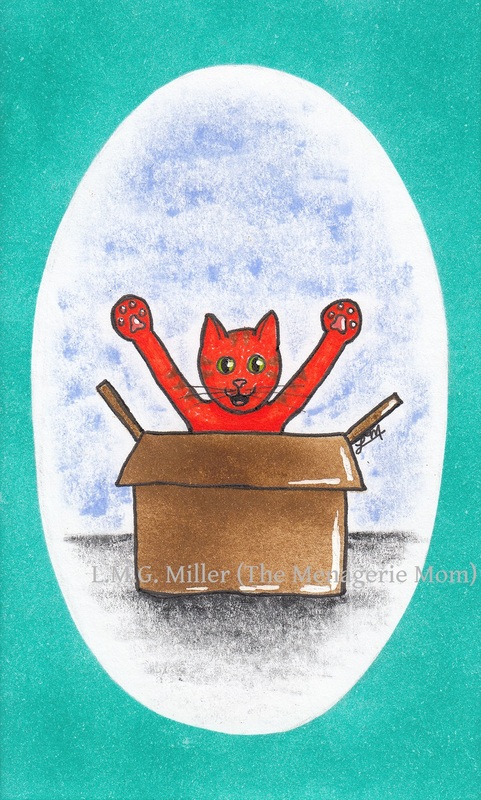 Get creative - cut all sort of doors and windows into the boxes, stack them together, adhere them together (but be sure all tape, glue, or other adhesives are hidden from any curious kitties). You can even get artsy and decorate it. The options are endless, and your kitty will love you for it! Friday! That means it's high time for the weekend, some rest and relaxation, and today's Friendly Fill-Ins challenge. The best brand of _________ is _________. I refuse to buy __________ unless there is a sale or a coupon. I am inspired by _________. 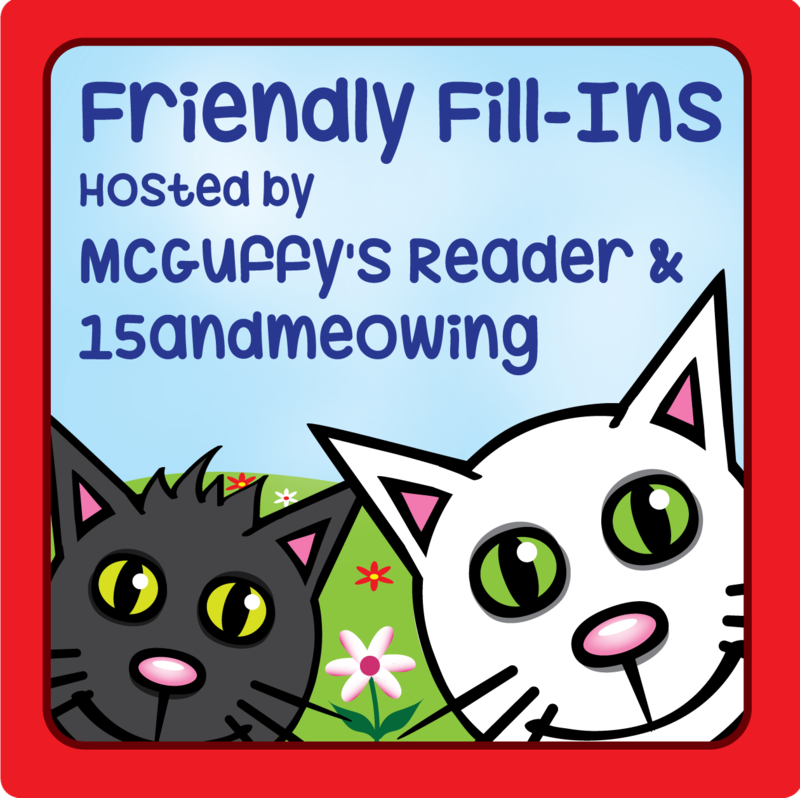 We hope to see lots of our furiends complete these fill-ins as well. They're great fun, and a perfect way to get to know our blogging buddies even better! Even the most active of kitties has to stop every once in a while to taste her toesies. "Mom! Were you peeping on my toesies tasting session?!?" We hope all our furiends have a lovely Friday! Did you know that cats meow primarily for the sake of communicating with us humans? Once they reach adulthood, cats don't typically meow at each other. They have other primary means of communicating with each other, such as body language. Those meows we know so well, therefore, are especially for us! That being said, if your kitty is talking to you, pay attention. Meowing is truly a means of communication. A meow can mean that your kitty is hungry, bored, lonely, in pain, or any number of things. So, please don't ignore that talkative kitty of yours. After all, those meows are just for you! Thimble Thursday usually means sharing shots of my little lady's cute, happy face or her adorable, silly antics. This week, though, Thimble was having none of it. Hmmm. How about something a little more, um, flattering? Goodness, try not to look so happy, Thimble. I guess my usual Little Miss Sunshine just wasn't feeling it. Fear not, though, because this little cutie never stays dour for long. More often than not, she just can't help but be a goofy little cuddle bug, and I wouldn't have it any other way. If your cat's favorite scratching post starts to look especially well-loved and ragged, perhaps consider revamping it rather than tossing it out. Even if it starts to lose its aesthetic appeal, throwing away that beloved scratching post could be hard on your kitty. After all, if the scratching post is looking ratty, it's because your kitty loves it! Although this largely depends on the individual cat and his or her tendencies, there's the chance that your kitty will have little interest in a new scratching post and might instead start sharpening its claws on furniture, carpet, or another unfortunate surface if that favorite scratching post suddenly disappears. That being said, consider getting some sisal rope to refresh your kitty's favorite scratching post once it starts looking past its prime. This won't only keep your kitty happy, but will also potentially spare your furniture and save you money by keeping you from having to purchase a new scratching post.